KAMULI – Busoga is in mourning following the passing of an icon, revered personality and a man who moved things in his days of service. The Bishop passed on this morning in what seems like an answered prayer, as he always said he wished to rest on either the 11th or 12th, his favourite days. 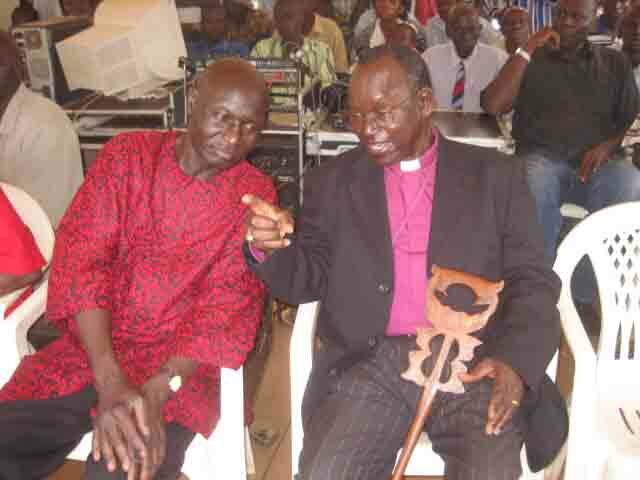 Benon Kigenyi a commissioner in the Ministry of Gender, one of the people Bamwoze mentored described the Bishop as a as a very inspiring evangelist, an assuring man of God, a very accomplished, tenacious leader, unequalled in zeal and courage. “We’ll be forever grateful for the love he gave, for the spiritual gifts he shared. May the Heavens rejoice in receiving him among the angels,” he wrote on his Facebook wall. Born in 1934 Bishop Bamwoze died this morning at Mulago Hospital where he has been battling cancer. Bamwoze lived his life to the fullest and while chairman Kamuli District Hospital he fell sick but refused to be taken to Mulago Hospital preferring to receive treatment at his hospital to boost, motivate and show trust and confidence with his team. Bishop Bamwoze took on Sustainable Community Aqua-culture for Poverty Alleviation- SCAPA- Project as his last in life, akasiimo (a bonus) to the community in a bid to interest them in the culture of working for a living. “I am creating social community impact conditions for community involvement in poverty eradication; this thing is not for me but a contribution to society. It involves hard work, critical thinking and initiative,” Bamwoze explained at the launch of the project. “We are being derailed by the quality of leadership and the breakdown of moral and spiritual fabric which now glorifies thieves. Through the changing scenes of life we have remained steadfast in our calling,” Mr Bamwoze who boasted of being the most senior Bishop in Church of Uganda said at his home in Nakakabala Mbulamuti Kamuli. Once the National Agriculture Advisory Services (NAADS) officials wanted President Museveni to visit his farm as a model farmer, Bamwoze declined, saying they were taking credit where they did not sow and insisted the President makes a special appointment to visit his fish farm, which he did. When the President visited, he commended Bishop Cyprian Bamwoze and named him his apostle for Bona Bagagawale (prosperity for all) project. Addressing the public at Bamwoze’s Fish Farm, on April 2, 2008, Mr Museveni said the Bishop was his buddy for long and that they share the same community visions and concerns. The President then said Bamwoze’s love for the community and heed to his call to help rural people move out of poverty makes Bamwoze now a community teacher on household income hence fulfilling God’s call to him to heal and feed the flock. Kadaga’s career “Those people pushing for it [Presidential ambition] are stupid, don’t dare, be satisfied with what you have and make the best of it, You are anointed as Speaker so be that as you are better at dispensing justice that is most lacking.” – Bamwoze to Speaker Rebecca Kadaga, also Kamuli Woman MP in response to the hype that seemed to link her to the presidential seat for 2016. “There is need for serious review of leadership structures for effective service delivery and management of resources. We need a system that will make leadership effective, accountable and inspirationally honourable. It renders leadership ridiculous to have an LC Chairman who doubles as a bhang gang leader, does not own a mere latrine and sees no value in education” – Bamwoze at the burial of Abuneri Wakaisuka in Mbulamuti. Documentation “People lack the art of recording events and buy diaries for fancy, if you don’t act now, tomorrow will be too late with nothing on record except verbalisation on air.” – Bamwoze. “We have reduced the clan to a mere family unit and children have lost the blood link with their grandparents.” – Bishop Bamwoze while officiating at the 50th wedding anniversary celebrations for Brewer and Joyce Abaliwano in 2008. “Some stupid men mistreat women under the pretext that they are their ribs yet marriage is a gift willed and commissioned by God.” Bishop Bamwoze at the wedding of Ronald and Zurea Mpaali Bukayi at St James Church in Jinja on February 13, 2010.